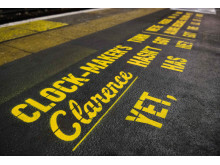 SPREADING a message of kindness this Christmas, Virgin Trains will be painting the script of iconic festive film ‘It’s A Wonderful Life’ on station platforms from London to Glasgow. 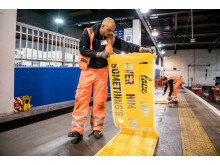 The script will be painted behind the yellow line that runs the length of station platforms and will use the same yellow paint. Frank Capra’s 1946 film, which is a staple of the Christmas TV schedules, is an uplifting story of family, love, hope, and redemption. But it is also the story of one man’s struggle with a life that hasn’t gone to plan. While the film may be over 70 years old, the message is as relevant now as it has ever been. The ‘It’s A Wonderful Line’ initiative has been developed with Virgin Trains’ charity partner, Rethink Mental Illness, in recognition of how difficult the festive period can be for some, and the positive impact that simple acts of kindness can have. The campaign will direct customers – via a URL embedded in the script – to information, advice, and support around mental health. 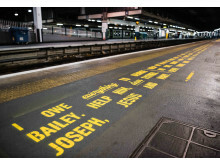 The initiative will be rolled out along the Virgin Trains West Coast route, with the film’s message of goodwill painted across station platforms in towns and cities that include; London, Birmingham, Liverpool, Manchester, Preston, Carlisle and Glasgow. 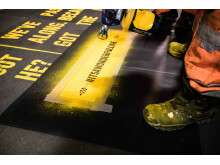 Over 7.5km of script will be painted over 14 nights in 14 locations, all of which are listed below along with the date the script will be on the platform. Rethink Mental Illness has worked with Virgin Trains since May 2017, training its people in how to deal with mental health issues that they might experience during their working day and in their personal life. This includes encouraging colleagues to talk about mental health, providing best advice on where to seek help and better equipping them to identify and support other people, such as passengers, who might be struggling. Throughout December, customers will also be able to watch ‘It’s A Wonderful Life’ on ‘Beam1’, Virgin Trains’ on-board free entertainment service. 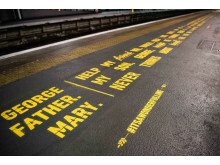 Volunteers from Rethink Mental Illness will also be fundraising at Virgin Trains stations throughout the campaign period. 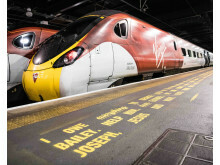 All of the painting will be completed by Bagnalls, Virgin Trains’ painting partner of 10 years, with help from Manchester-based Laser Cutting Services which custom-manufactured the stencils for the painting. 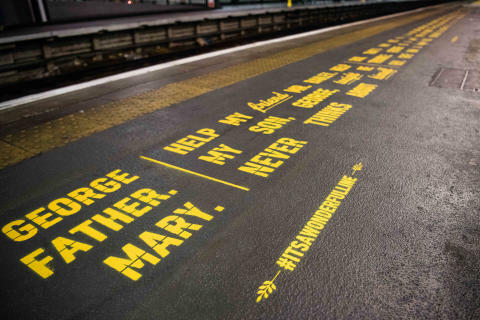 Virgin Trains has been granted full permission from all participating parties to use their company names and franchises within the ‘It’s A Wonderful Line’ campaign – this includes Paramount Pictures, Network Rail and Rethink Mental Illness. 1) Beam lets people view a range of blockbuster movie titles, TV shows, newspapers and magazines. Rethink Mental Illness is a leading charity provider of mental health services in England. They support tens of thousands of people through groups, services and advice and information. They train employees, employers and members of the public on how best to support someone affected by mental illness. All of this work guides their campaigning for the rights of people with mental illness and their carers. Together with the charity Mind, Rethink Mental Illness also runs Time to Change,a growing movement of people changing how we all think and act about mental health problems. Rethink Mental Illness is part of Mental Health UK, a network of four charities, together with Hafal in Wales, Support in Mind Scotland, and MindWise in Northern Ireland. For access to a range of free images to accompany mental health news stories please visit: https://www.newscastimages.com/These images have been developed by Time to Change. 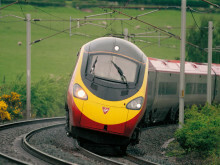 Stagecoach and Virgin are working in partnership to operate the West Coast inter-city route under the Virgin Trains brand, revolutionising travel on one of the UK’s key rail arteries. The network connects some of the nation’s most iconic destinations including Glasgow, Liverpool, Birmingham, Manchester and London. Virgin Trains is committed to delivering a high speed, high frequency service, offering shorter journey times, more comfortable travel and excellent customer service. Customers consistently rate Virgin Trains ahead of other long-distance rail franchise operators in the National Rail Passenger Survey (NRPS) commissioned by industry watchdog, Transport Focus. 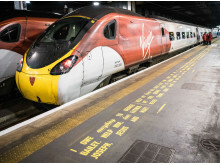 Virgin Trains has a proud record of challenging the status quo - from introducing tilting Pendolino trains, to a pioneering automated delay repay scheme, introducing the industry-leading onboard entertainment streaming service, BEAM, and becoming the first franchised rail operator to offer m-Tickets for all ticket types. Virgin Trains operated the East Coast route between March 1, 2015 and June 24, 2018. In that time, we invested £75m to create a more personalised travel experience, including over £40m in the existing fleet. Customers have benefitted from 48 additional services between Edinburgh and London every week, and an extra 22 Saturday services between Leeds and London – a total of 1.74 million additional seats since May 2015. Working together, the partnership railway of the public and private sectors has published a long-term plan, called In Partnership for Britain’s Prosperity, to change and improve Britain’s railway. The plan will secure almost £85bn of additional economic benefits to the country whilst enabling further investment and improvement, and contains four commitments which will see rail companies: strengthen our economic contribution to the country; improve customers’ satisfaction; boost the communities we serve; and, create more and better jobs in rail. For more information go to Britain Runs on Rail. Visit the Virgin Trains Media Room - virgintrains.co.uk/about/media-room - for the latest news, images and videos. Subscribe here for regular news from Virgin Trains.